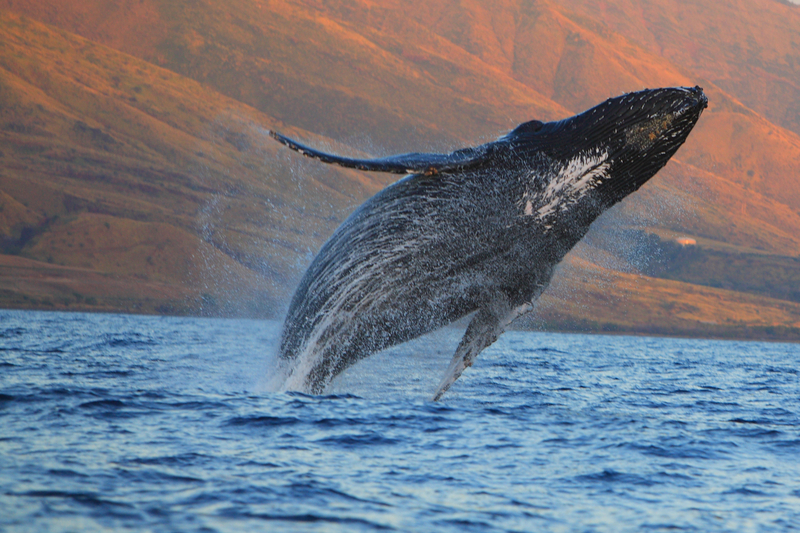 Without question, Maui is the best of the Hawaii Islands for viewing the Humpback Whales. Several of the Hawaiian Islands claim to be best for humpback whale watching, but I just don’t think they can compete with the island of Maui. Most of the humpback whales that winter in Hawaii live in the Au’au Channel between Lana`i and Maui. These whales migrate 3,500 miles from Alaska each autumn and spend the winter months mating and birthing in the warm water next to Maui. During this period, the whales can be sighted in pods with several adults and one or more calves. They are easily spotted from the shores of Maui. While I have taken whale-watching boat tours, during the peak of whale season, it is quite nice to just sit on the balcony of your hotel and watch the whales breaching. What makes them so easy to spot is that when they are in the mood to come out of the water, they usually breach more than once. So if someone in your party spots a whale, you can usually focus in on the area where one was last spotted and the whale will reappear there or close by. 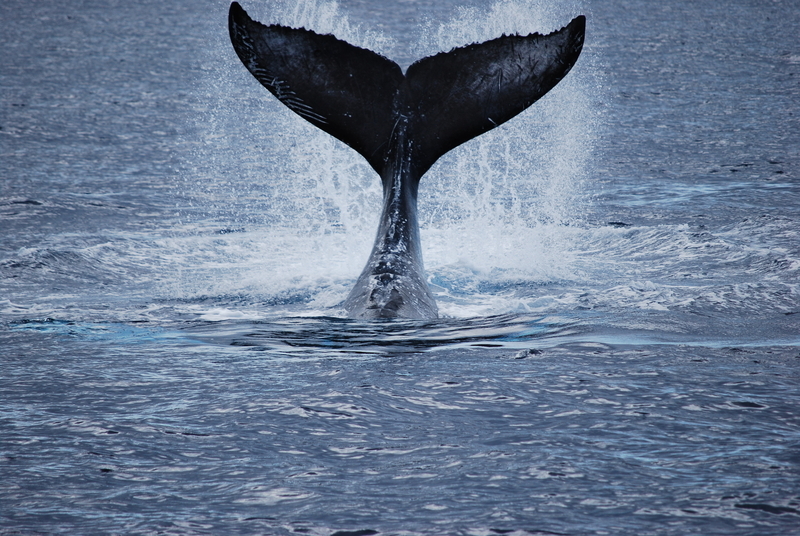 If you are interested in whale watching, your first requirement would be to schedule your trip to Maui in the winter. I have been to Maui during different times of the year, and the difference between March and May in terms of whale watching is drastic. In March you can see them frolicking all day long. One May, we took a whale-watching boat out and over a two-hour period, we saw the tail fin (fluke) of the last whale leaving Maui. We learned our lesson and planned accordingly after that. Most boat tours will give you a discount on your tickets if you purchase them online in advance. For photographers, bring a zoom lens up to 300mm for those close-up shots. Due to the wild movements of the boat on the ocean and the action of the whales, set your shutter speed to 1/500 of a second or faster to compensate. From the boat, it is easy to spot whales in the immediate area as they are so large: Adults grow up to forty-five feet long. The calves are around ten to fifteen feet long. The gestation period of a humpback whale is one year, so a whale may be conceived in the Au’au Channel and born a year later in the same place. The newborns and their mothers usually remain quite close to the shore to nurse and rest. The calf survives on its mother’s milk for six to eight months, drinking about 100 gallons of milk per day. Calves typically double in size their first year. On your boat tour, the captain may tell stories of different whales you are observing, and you might wonder how he can tell one whale from another. Whale’s tails, or flukes, have a unique pattern and coloration, much like we have different fingerprints. This makes it easy for scientists and others to track specific whales. 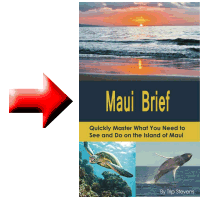 Whether you decide to take a boat cruise or just keep your eyes alert from the shore, if you travel to Maui in the winter months, you will get a treat unlike anything else, anywhere else.